We’ve often lamented the low level of capital spending—bad news for productivity and income growth—despite high rates of corporate profitability. Here’s another perspective on that: real rates of return are higher than returns on financial assets, but that hasn’t led to a rush of capital into real investment. 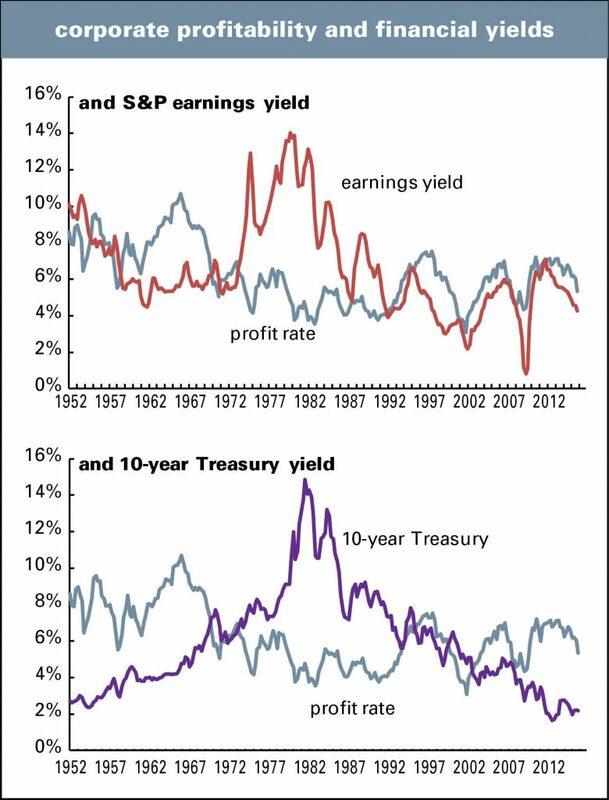 Graphed below are two financial rates of return—the earnings yield on stocks (the inverse of the P/E ratio) and the ten-year Treasury yield—against our measure of nonfinancial corporate profitability (pretax profits from the national income accounts divided by the value of the tangible capital stock from the Fed’s financial accounts). Note that in recent years, returns on real capital have been comfortably higher than financial returns. Since 2012, the earnings yield on stocks has lagged real returns by an average of 1.1 percentage points—not as big as the 1.9-point gap of the late 1990s, when there was a gusher of real investment that produced a serious acceleration in productivity growth, but still wide compared to the -0.3 point average of the full 1952–2015 scope of the graph. The gap with Treasury yields is even more striking—4.4 points since 2012, compared to an 0.3 point average in the late 1990s and 0.4 for the full 63-year history presented here. Profitability is now weakening, so the relative lure (at least on paper, or its silicon equivalent) of real investment is losing some of its charm. But this period of high real returns and low investment is looking like a missed opportunity. That so much corporate cash has been either hoarded, or devoted to buybacks and M&A, is not what long-term prosperity is made from. (Along with mildly tightening standards on C&I loans, the Fed’s recent loan officer survey found weakening demand for them, with “decreased investment in plant or equipment [as] the most commonly cited reason.”) Thirty years ago, as the buyout and buyback booms were just getting going, Peter Drucker wrote: “Everyone who has worked with American management can testify that the need to satisfy the pension fund manager’s quest for higher earnings next quarter, together with the panicky fear of the raider, constantly pushes top managements toward decisions they know to be costly, if not suicidal, mistakes.” It’s amazing how little has changed since the mid-1980s.